FILE - Secondary school students sit for an exam in Riyadh, Feb. 7, 2009. Media reports suggest students use Captagon to stay alert during exams. When authorities at Beirut’s international airport confiscated two tons of the amphetamine Captagon on board a private jet belonging to a Saudi prince last week, it focused attention on an issue rarely discussed: drug abuse in Saudi Arabia. Captagon, the brand name for the synthetic stimulant fenethylline, was developed in the 1960s to treat hyperactivity and narcolepsy. It was banned in the 1980s because of its potential for abuse, but a knock-off version continues to be illegally manufactured in small-scale labs in Lebanon, Turkey and especially Syria. A masked, black-clad militant, who has been identified by the Washington Post newspaper as a Briton named Mohammed Emwazi, brandishes a knife in this still image from a 2014 video obtained from SITE Intel Group, Feb. 26, 2015. Some analysts believe that Captagon abuse may account for Emwazi's violent behavior. ​Western media have made numerous attempts to link the drug to Syria's militants, in particular the Islamic State group, whose fighters reportedly use it to increase their strength and prowess in battle. 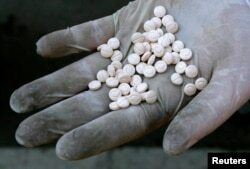 But the real market for the drug is Saudi Arabia, which consumes more Captagon than any other country and, according to the UNODC, accounts for a third of all global amphetamine seizures. In 2011, the last year for which figures were available, the Saudi kingdom seized a whopping 11 tons of amphetamines, predominantly Captagon, up from nine tons in 2010. Captagon has been found hidden inside machine parts, stuffed into fruits and vegetables and even delivered via parcel post from outside the kingdom. The penalty for drug trafficking — at least for foreigners and nonroyals — is death by hanging or by decapitation. The Saudi government encourages informants by rewarding them half the cash value of whatever drug is seized; the remaining cash value is divided among the officers arresting the drug dealer. Havocscope, a website that tracks data on international black marketeering, estimates drug trafficking to be a $6.1 billion business in the kingdom. U.S. Drug Enforcement Agency (DEA) special agent Joseph Moses had never heard of Captagon until he was sent on assignment to Istanbul in the late 1990s. “When I asked what Captagon was used for, I was told it was for the euphoric effects, similar to amphetamine, and, second, that it was also used for its Viagra-like effect on the libido,” Moses said. Many users are young men, according to Justin Thomas, an assistant professor of psychology and psychotherapy at the UAE’s Zayed University and author of Psychological Well-Being in the Gulf States. Research shows that some users are as young as 12. Media reports suggest students use Captagon to stay alert during exams or to wake up early after late-night socializing. “There are known cases of women using it for weight loss, too, but how widespread that is, is anyone’s guess,” Thomas said. Calorie-rich diets, a sedentary lifestyle and a prohibition against outdoor sports contribute to the fact that more than 44 percent of Saudi women are clinically obese. But the fundamental problem may be boredom. “There are no cinemas, a paucity of athletic fields and courts, and virtually no student-led campus life with activities such as clubs, sports or newspapers,” writes Wilson Center scholar and author Caryle Murphy. Strict gender segregation and high youth unemployment — about 30 percent — make youth more susceptible to frustration and depression, says Murphy. A Bulgarian customs officer displays Captagon pills confiscated in Sofia, Dec. 12, 2007. Part of Captagon’s appeal in Saudi Arabia, where the religious taboo against drug use is strong, may lie in its innocuous appearance: It is a small, scored white tablet that resembles any over-the-counter drug. The government, he explained, may take a harsh approach to smugglers and dealers, but is far more lenient with drug users. “The latter are mostly seen as victims who are in need of treatment and counseling, rather than criminals who deserve punishment,” Nazer said. The government sponsors drug rehabilitation centers in four cities: Riyadh, Jeddah, Dammam and Qassim. Because of the stigma surrounding addiction, there are no accurate figures for the number of addicts being treated, other than what can be gleaned from occasional newspaper reports. The center at Jeddah recently reported it takes in four to nine new patients a day, mostly men, and reports suggest as many as 40,000 to 50,000 Saudis go through drug treatment annually. But that doesn’t include those who, fearing exposure, go to addiction treatment centers in Europe or Asia, where along with detox, they can enjoy massages, saunas and five-star accommodations.